Where can I find information about the PRS-68 diver? I read that a couple of weeks back. What a magnificent review!!! Said it before and I'll say it again, one of the best things about a new watch from Eddie is getting a new review from Ewan. This just completely changed my view on the Miyota 9015. "One aspect of the calibre’s simplicity is the unidirectional winding of the rotor – in layman’s terms, the rotor winds the mainspring when it rotates in one direction; if it rotates in the other then it does not – it freewheels. I always had mixed feelings about this arrangement without really doing any research. Being so impressed with the PRS-68 in all other aspects thus far, I thought I would see if there might be any benefit (apart from mechanical simplicity) of the unidirectional winding system. I am lazy, without doubt. Or perhaps to be fair, my lifestyle is relatively sedentary. If I am wearing an automatic watch the winding of such needs to be efficient; and to my delight, it appears that with a non complicated automatic movement (e.g. no chronograph) then unidirectional winding is the order of the day. It has been proven to be more efficient than bidirectional winding in many conditions – including those of slouches like me. The technical aspects of this (which I shan’t explore in any depth) concern inertia and dead angles – basically, the less mechanical resistance that the winding mechanism has to overcome in order to wind the mainspring then the more quickly the mainspring will become wound. A bidirectional system uses a relatively high proportion of the angle of swing of the rotor when the rotor changes its direction of rotation just to get the reverser mechanism ‘sorted out’ before transmitting energy to the mainspring. This is particularly critical when small movements of the wrist translate into gentle back and forth rocking of the rotor. A good proportion of that gentle rocking is not actually doing anything apart from setting the reverser mechanism (whatever type it might be) ready for further rotation of the rotor which might not actually take place. A unidirectional winding system on the other hand, has no reverser mechanism. Whilst the rotor is moving in the non winding direction it is doing nothing for the mainspring (and we can hear it freewheeling); but the vast majority of energy from the slightest movement in the winding direction is transmitted efficiently – the dead angle is less and the mainspring is wound more. I decided to conduct my own experiment on the basis of the above. With the PRS-68 absolutely stopped, no power at all, I gently twisted it and tilted it back and forth for precisely three minutes. I didn’t put it on my wrist, just held it and moved it. It took almost all of those three minutes to get up and running but once the seconds hand was scurrying its way along, I set the watch back in the box and waited. From those three minutes of movement the watch ran for no less than 6hr 25min. Thus, it appeared that three minutes of movement gave me about one seventh of total power reserve! Very impressive. Next, I did exactly the same with a brand new Seiko 4R36 (bidirectional winding) equipped watch, moving the watch in very much the same way as the Smiths for the same amount of time – the Seiko ran for 3hr 55min. 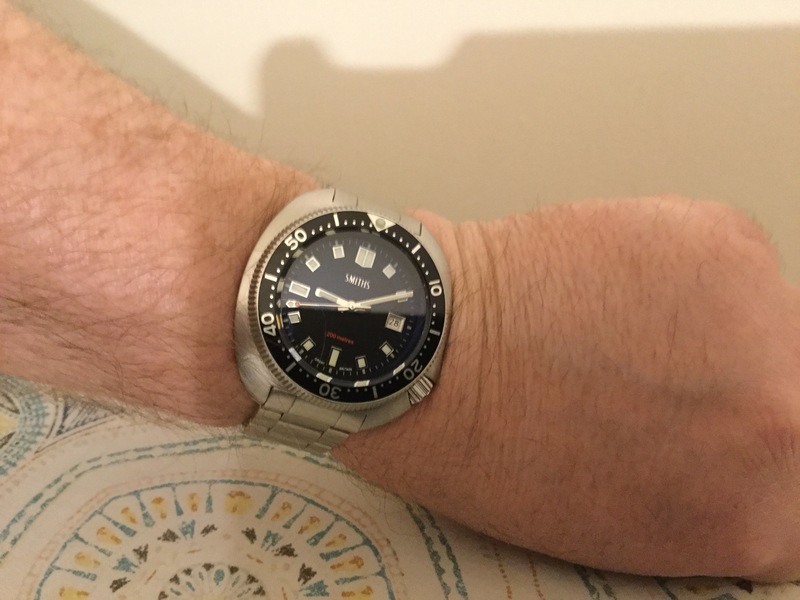 Whilst my little experiment wasn’t particularly scientific, it seemed to back up JLC’s findings and it has to be said, gives me great confidence in the Miyota 9015. It is more efficient than an equivalent mainstream Seiko movement – for me anyway. For those more active then the chances are that both systems are just about equal." There's one up for sale. Unidirectional is actually better than bidirectional... because there are less parts to go wrong or wear out. Performance wise, it makes no difference. One on eBay now. With three days still to go the bidding has reached £470. Last edited by seabiscuit; 12th February 2019 at 08:24. I know that now because I did read the part I quoted and posted. Although I doubt if "less parts to go wrong" comes into it. The wobble is still annoying though and I would still choose a 6R15 over a 9015 every time. I probably won't hesitate to buy a 9015 powered watch now though. I missed the one on mywatchmart, keeping a sharp eye on the one on Ebay. A lot of good information since I'm not familiar with the 9015 movement. Finally found a PRS-68........its in the US finally and heading to Virginia soon!!! The PRS-68 arrived today!! What an amazing watch!! Working on that...thought I knew how to post a pic! Last edited by WatcherofTime; 1st March 2019 at 03:17. It took me about a week or so to read the review(work got in the way).....I didn't want to miss a word! After that I was hooked and I knew I had to get my hands on one. Does anyone know how many were made and when the PRS-68 was discontinued?? Perhaps Eddie is already aware - but the current re-issue mania will likely fuel a strong demand for the PRS-68. Based on the reports from Baselworld 2019 a particular Japanese re-issue is being introduced for $4,250. At this price point most of us are interested in other options. ""A PRS-68 re-issue would do nicely."" I totally agree with you. I was aware of the 6105 re-issue and the ridiculous price but I didn't want to interfere in the thread with it. I'm gonna buy all of the PRS-68s I can find. Love that combo, I stupidly sold mine an bought a black turtle. Hope you do another run of these watches. I missed out on the 1st run but am on the lookout for a good used one. Why does the guy on Ebay keep re-listing it? Yeah, I'd like to know that - because it seems to get bid on - and reaches a high price. Can't figure it out. Bidding goes past the reserve and then its listed again with the same pictures. I'm just curious, not bidding on it. The seller is bidding it up from another account. Easy thing to do especially with a £1 listing promo. He probably had the wife and kids bidding on it and his max loss each time is £1. Only takes one serious bidder to jump in at the end and he has achieved his objective. Not condoning it, but it's easy to see how it's done.